How bad can you burn your tongue? Nah, I didn’t burn my tongue. I had some fine buffalo wings though at the annual Hockomock YMCA fundraising event the Wing Off. 10 local restaurants faced off for title of the Best Buffalo Wings. And who reaped the benefit? Well, I surely did, my donation got me nearly all the wings I could eat (Mentally I could have eaten more but my stomach was telling me no way). The event had live music, a party atmosphere and plenty of wings for all your taste buds. 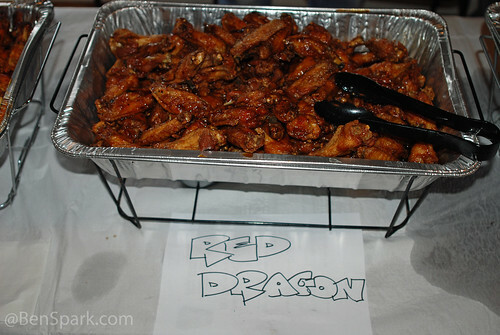 MY favorite was the Red Dragon wings from Tom’s Tavern in Wrentham. They were just the right blend of hot and sweet. There were other favorites there like Jennerations Cajun Buffalo wings and new favorite to me the straight up buffalo taste from J&M Sports Bar. J&M had the crispiest wings and that is exactly how I like them. Last Year’s winner The Cheiftan had some Guinness wings and they were amazing. A very tasty dipping sauce went with those wings as well. I took a few photos at the event. You can see them all in my Wing Off 2008 Flickr set. Durn it! I almost, almost quelched the craving. And now this. I’m leaving right now to get mine. Taco Mac will have to do. Taco Mac? Is that Mac and Cheese with Taco meat? Sounds good. Ok, even I have to admit, with that rich, brown color, they do look quite appetizing in that pan! And seeing as it’s a YMCA fundraiser – I’ll take back my turned up nose! LOL!! They were very very tasty. I ate too much, but they were worth it. So good.